Once a sacred Aboriginal meeting place and now a destination for those seeking healing, Byron’s reputation as a centre for complementary therapies makes it ideal for anyone looking for a restorative wellness retreat. Here, you’ll have access to a wealth of healing modalities practised by some of Australia’s best therapists and integrative doctors, while immersing yourself in the naturally calming, pristine surrounds. Whale watching - From May to October, look out for whales frolicking in the bay as they pass through on their migration journey. All year round, you’ll encounter amazing local wildlife such as dolphins, sea turtles, wallabies, echidnas, koalas and a vast array of sea birds. Swim in the ocean - Allow the crystal clear water of Byron’s pristine beaches to rejuvenate your body and mind. Some of our favourite spots to swim include Wategos Beach, The Pass and Belongil Beach. Walk Cape Byron - The 3.7km loop track from Captain Cook Lookout to the Cape Byron Lighthouse is breathtakingly beautiful. Attempt it early to watch the sun rise over the most easterly point in Australia. Visit the Byron Farmer’s Market - Explore the region’s abundant seasonal produce at this bustling market, on Thursday mornings from 7am. 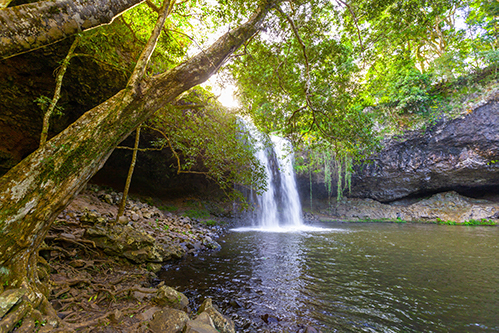 Discover the Hinterland - Take a drive into the lush hinterland behind Byron Bay, where you’ll find charming country towns, hidden waterfalls and spectacular views of the coast. Focus on your health - A renowned wellness hub, Byron Bay attracts some of the country’s best health care practitioners to its shores. The Health Lodge is located in the iconic coastal town of Byron Bay, on the north coast of New South Wales. Conveniently located 1.5km from the vibrant town centre and Byron’s beautiful beaches, you can give your wellness a boost in Byron by booking a consultation with our expert team. Enjoy a massage, tune up your health with one of allied health professionals or discover the answer to your niggling health issues on a medical retreat.